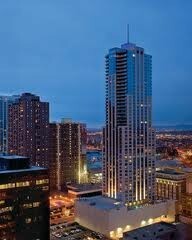 In a city that's already one mile high, Four Seasons Hotel Denver soars even higher. Within a landmark tower crowned by a glowing spire, you'll find the Hotel in the heart of Denver’s theatre district and within range of the Rocky Mountains, both viewable from the Hotel. At EDGE Bar, a tapas-style menu meets local microbrews and over 50 wines by the glass. An old English rhyme is but one of the many time-honoured traditions that see couples down the aisle to the post-vow kiss and the happily ever after. It’s also a custom that Four Seasons Hotel Denver honours, with a modern update. Whether yours is a sizeable event held in the Grand Ballroom, or an intimate affair in the Aspen room, you’ll find your every “something” is covered in spectacular fashion. The magnificent backdrop of the Rocky Mountains—the youngest of which uplifted 65 million years ago—symbolizes the old. Representing the “new”: the newly built Resort itself.